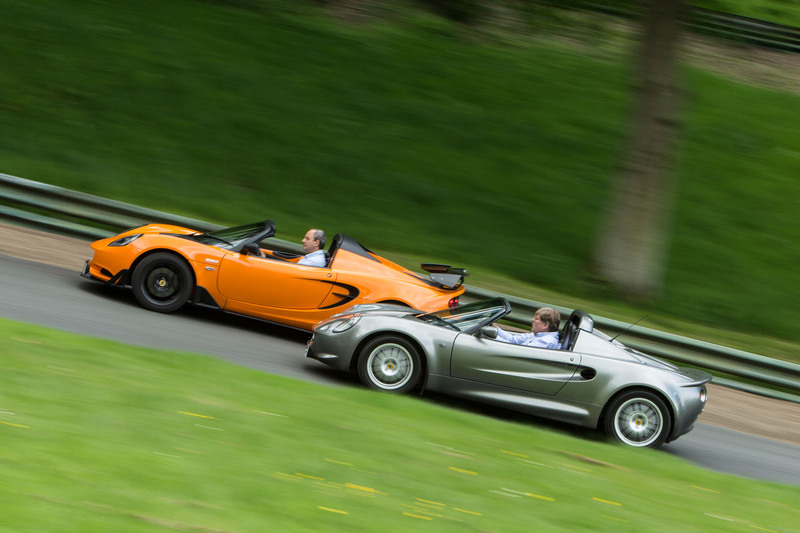 It's been two decades since Lotus first unveiled the Elise, so how does the original Series 1 stack up against the latest model, the Cup 250? 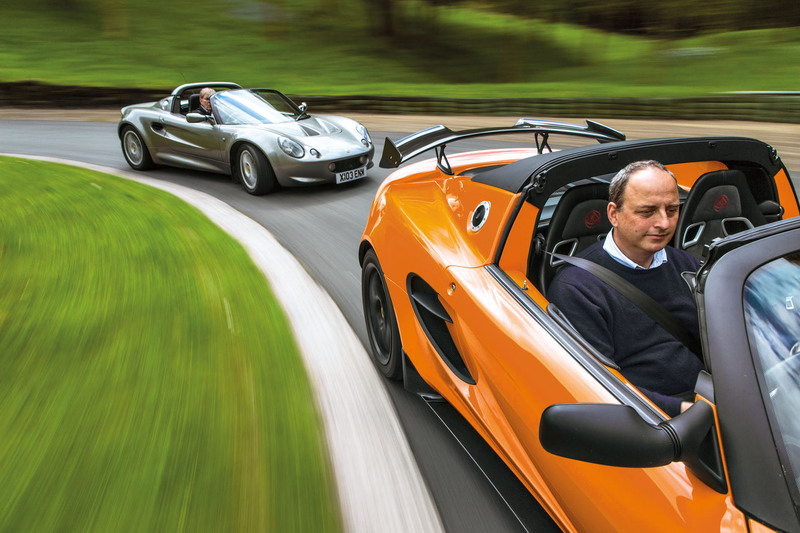 Can it really be 20 years since the Lotus Elise was born? Back in 1996 there was a bloke called John Major in Downing Street, Charles and Diana were still married, Max Verstappen was not even a glint in Jos’s eye and no one had even heard of Harry bloody Potter. And yet that drive in the original Elise remains hardwired into my brain as if it were yesterday. Even following on from supercars such as the Jaguar XJ220, McLaren F1 and Bugatti EB110GT as it chronologically did, it’s remarkable that it was there at all, for this was not a normal era. I remember the poise and the extraordinary steering but most of all the joy borne from the certain knowledge that the Elise was going to do what all those bigger, faster, more expensive models of Lotus’s recent past had failed at: it was going to save the company. Little did I suspect that, 20 years later, it would still be at it. Of course, today’s latest Elise, this Cup 250, is a very different machine from the one I swooned over two decades ago. The base philosophy is the same – a mid-mounted four-cylinder engine driving the rear wheels alone though a manual gearbox, powering a chassis made from extruded, bonded aluminium sections and clothed in simple glassfibre bodywork – but the details are completely different. Where the original Elise came only with Rover’s light and clever 1.8-litre K-series engine developing 118bhp, today’s quickest Elise has a similar-sized Toyota motor, but supercharged up to 243bhp at 7200rpm – more than twice the power of the original. Ah, but what about the weight? There is a common misconception that today’s Elise is a bit of a bloater compared with the original, which is well but erroneously remembered as weighing around the same as a box of air. Well, the first Elise was very light but, when measured at the kerb, not quite the 700kg sylph of popular perception; and that was with the aluminium brake discs that quietly disappeared from the spec sheets within two years of the car going on sale. Consider that today’s Elise has a supercharged engine, a six speed gearbox, airbags, electronic traction control, necessarily beefed-up suspension, bigger (iron) brakes, fatter tyres and rather better construction quality, and perhaps the biggest surprise is that the fully tooled-up Cup 250 doesn’t weigh more than 921kg unladen. To get there, it has a lithium ion 12V battery, lighter wheels, carbonfibre seats and an optional carbonfibre aero pack. But first to our very own Steve Cropley’s very own Series 1 Elise. It isn’t one of the oldest around, but is broadly representative of the car in its first incarnation. The only variations from standard are its engine chip, thought to tickle engine output up to a little over 130bhp, and slightly wider front tyres. It’s done more than 70,000 miles but still feels supremely fit. Experience with our long-termer at the time and that of many owners since shows that properly maintained early Elises can be exceptionally reliable high-mileage machines. Drop down into the cabin – and it is some drop – and you are reminded right away just how minimalist these cars once were. Bare aluminium is everywhere, the dashboard a simple strip along the width of the car with a pair of Stack dials mounted in a pod in front of you. A spindly gearlever sprouts from the centre of the car. I love it in here, particularly details such as the drilled aluminium passenger foot rest and perforated window winders. This is what you hope for from those weight obsessives at Lotus. The K-series engine still sounds good, which is to be expected. The bigger surprise is that it still makes the 16-year-old Elise feel fast – properly fast – by the accepted standards of fast modern cars. There’s plenty of torque, and if the gearchange were a little swifter around and tighter within its gate, the powertrain would be near faultless. I remember that, too. However, it's the poise I was searching for, that unique way the Elise addresses the road, and it didn’t take long to find. The steering on Steve’s car is a little heavier than I recall, quite possibly due to those bigger front tyres, but the feel is all there, and with it the confidence it inspires. The car is so supple, so good at shrugging off the challenge of crests, cambers and surface changes, that it makes you want to drive until the tank has run dry. Indeed, its softness and willingness to communicate are old-car characteristics, yet its pure point-to-point pace seems not one whit diminished by the passage of time. In this regard, it feels completely contemporary, and soon I realised that this blend of old-school subjective assets and raw ability that is absolutely up to date lies at the heart of the original Elise’s appeal. I wasn’t interested in finding out how much faster the Cup 250 is than the old Elise, so I’ll restrict my comments to saying that on the track I would expect the gap to be greater even than their on-paper specifications suggest, not least thanks to the modern car’s extreme track day tyres, the genuinely effective downforce of its optional carbonfibre wing and the increase in brake disc swept area. Conversely, on most public roads there’d be little in it, because the old car is still so rapid - to actually drive the Cup 250 in the way that would be needed to significantly outpace the early car from one place to the next would probably require a driving style which is now deemed socially unacceptable. I was far more interested in seeing what flavour of the old Elise remains now that surely they have very few parts in common. And what is extraordinary, to me at least, is that it’s all still there. Drive a modern turbocharged, water-cooled Porsche 911 Carrera and you’d recognise very little indeed of the normally aspirated, air-cooled 911 you’d have bought 20 years ago, with its stumpy wheelbase and hydraulic steering. Drive two Range Rovers 20 years apart and you’d recognise nothing at all. Yet the Elise Cup 250 just feels like an old Elise that has spent most of the intervening two decades pumping iron in the gym. The almost liquid smoothness of the steering, the way it can be threaded with millimetric accuracy through gaps, and the fluency of its chassis seem so similar that it could only have come from the same place, and that place could only be Lotus. You might think that now should be the time to be critical of a car that has moved the game on so little in such a long period of time, but that’s not how I feel. The history of the British sports car is littered with the corpses of those that started sharp, lithe and light and ended with their looks bloated, their waistlines widened and their driving dynamics dulled, and you have only to look at the E-Type Jaguar, Aston DBs 4 through to 6 and the MGB to know it. Not so the Elise Cup 250. Heavier it may be, but it feels yet more taut, poised and ready for action. Put another way, in the past 20 years it has lost not one mote of what is important to its identity – its 'Lotusness', if you like – and gained a couple of other welcome assets in the form of pulverising grip and monster acceleration, which were never really pillars of Lotus street car heritage but are still very nice to find. It doesn’t feel in the least bit old in the same way that, say, an Aston DB9 or Jaguar XK feel old despite both being far younger designs, or if it does, it is only in the positive sense that road cars just don’t steer like this anymore. There can be no questioning how well Lotus has kept this car not just alive but true to its brand values, despite the fact that it is years past its intended replace-by date and the company has had nothing like the money it would have liked to have spent upon it. Mind you, there is no question which is the greater car of these two Elises. Today a Cup 250 is a superb - albeit very expensive - weapon. 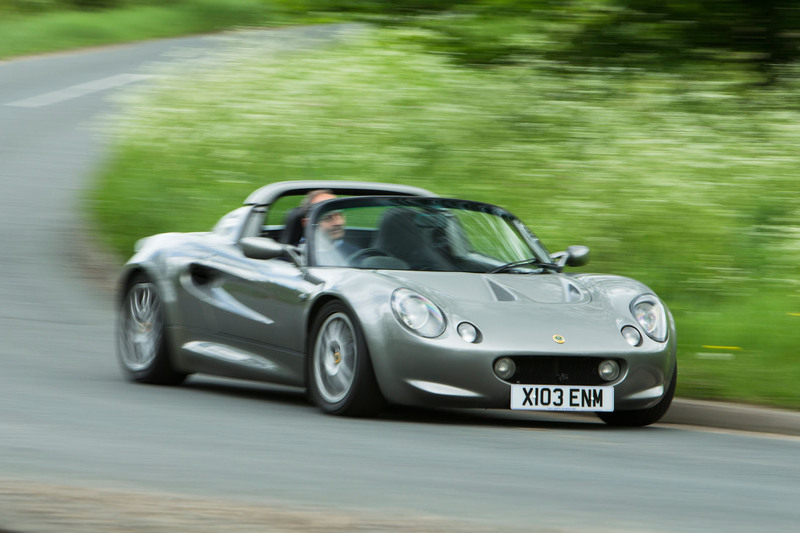 It straddles the gap between road and track car with rare aplomb and will hopefully play an important role in keeping Lotus alive until the next Elise is ready in 2020. But the original was a revolution, a game changing, life saving landmark in sports car design, so clear in conception and fluent in execution that history will place it among the finest sports cars this or any other country has ever produced. Truth is that if you really want a car that epitomises everything we love about Lotus, an original Elise will do it as well as any we know – and one can be yours right now for the price of a small family hatchback. Wow. Is this the second oldest road car in production now, after the G-Wagon? Andrew, do remember a sunny afternoon at Goodwood Circuit in the first year of the Elise's life, I was actually talking to you about my disappointment in my new Elise, and the way it spun so terribly easily and terrifyingly, you looked at me like I was a madman, and I explained that all my friends who were racing drivers had driven it, and they all thought it's handling had been massively over-hyped by the journalists of the time ? The best bit of our conversation was yet to come, as we were talking we heard an altercation, and looked across to Woodcote Corner and there was a young man spinning his new Elise backwards into the wall ? I smugly said to you "that illustrates my point rather well ". What ever was wrong with those early cars has certainly been erased over time, but they were in my view, pretty tricky cars to drive, with massive lift-off oversteer. 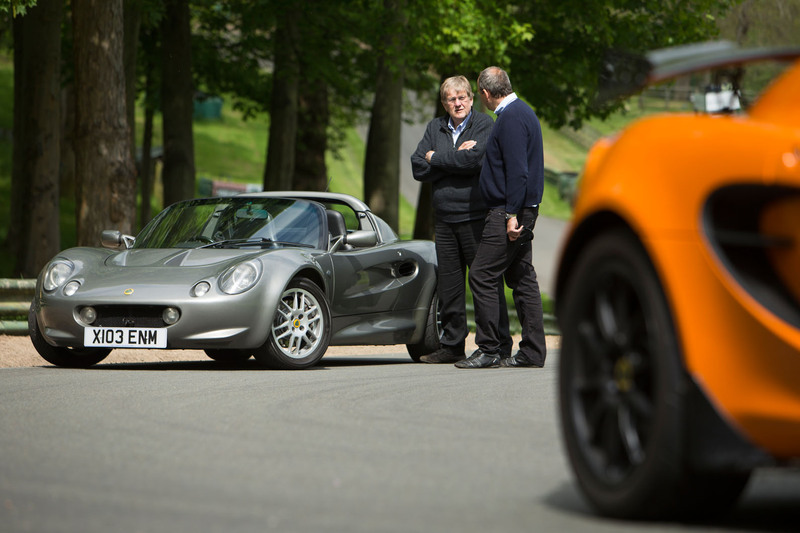 As a track day regular, I knew I was correct and the press were wrong, because so many Elises were being crashed around me on tracks, it was pretty much every event I went to, someone would have a big shunt in an Elise. Years later I met a revered engineer who explained to me that the tyre manufacturers didn't really take the car seriously and so it launched on the wrong front tyre, hence when the second generation cars came along they ran a bespoke narrower front tyre which limited the front end grip and made the car much safer in the hands of normal folk . Totally - earlier cars considerably prettier to these eyes.